After the successful Face/Off, director John Woo fiddle with several promising projects for almost half a year before settling down to direct Mission Impossible 2. Among the above projects were producing an animated feature called Blue Planet voiced by Matt Damon,directing his favourite leading man Chow Yun-Fat in either King's Ransom or Hard Boiled 2(the former however got trapped in re-writing hell till today)and directing John Travolta in the musical film version of Phantom of The Opera (with guns of course). M:I-2 would eventually cost three years of Woo's working career and proved to be the most problematic film which John Woo would be involved in. Rumours has it that Woo clashed with the studio on the film budget and his working relationship with superstar Tom Cruise wasn't a pleasant one. The problems didn't stop well until the filming ended; the original ending which features a massive car chase in downtown Sydney and the fistfight in an open-roof car had to be scraped off at the last minute and replace with the motorbike joustling and fistfight on the beach. Uncorfirmed rumours said that the final cut of the film was removed from Woo's hands and further hacked down to received a PG-13 rating and NOT a R-rating. John Woo later confirmed in an interview that before working on the film, everyone agreed that the film was going to be an PG-13 and brushed aside the ratings rumours. Tom Cruise reprises his role as IMF agent Ethan Hunt who must retrieve a deadly virus Chimera at the hands of renegade IMF agent Sean Ambrose (Dougray Scott). He enlists the help of computer expert Luther Strickell (Ving Rhames),helicopter pilot Billy Baird and professional thief Nyah Norton Hall (Thandie Newton) which happens to be Ambrose's old flame. Matters become difficult when Ethan falls for Nyah and she gets caught between the two men going at war against each other. I decided to wait until the year (2000) has finish and all the hype surrounding the film has died out before writing a "review" of the film. I feel that this column is getting more and more difficult to write as film reviews are written by film critics who have experience in a wide spectrum of film genres and NOT fans like myself. Granted if this "film review" was written sometime in May 2000 around the release of the film it would turn out to be more positive. Why you ask? Same case with Chow Yun Fat in The Replacement Killers, it didn�t matter at that point that the film was mediocre it was just great to have the screen legend back on the silver screen after a three years absence. 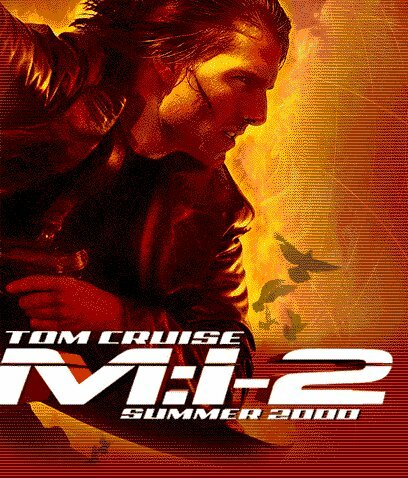 MI2 was just the same, Woo has been absent for three long years after Face/Off with just Blackjack released on home videos between the break and although it�s not any of his fault, three years was difficult to bear. It was great to have Woo back at the helm, showing Hollywood directors how it�s done and reclaiming his throne as one of the best directors in the world. Many critics have dismissed MI2 despite its� huge box-office takings because the fact remains, box-office numbers do not generally mean the film is good and vice versa. Fight Club may have under-performed at the box office but it�s fair to call it a bad film? I certainly don�t think so. Now before I start sounding more like those pathetic Star Wars geeks who kept defending their hero George Lucas and the recent dismay Phantom Menace, let me make it clear that I�m trying not to be biased. MI2 is not a great film, certainly not one of the director�s best if you compared with Hong Kong cult films. But here is John Woo trying his best to work on a Hollywood blockbuster, trying not to follow the constraints of a formulaic franchise film. In that respects, John Woo has certainly succeed as MI2 is far from formulaic especially if you compare it with recent summer blockbusters like The Matrix and the extremely hollow The Mummy. In fact it has more depth than any recent blockbusters that come to mind except maybe Ridley Scott�s epic Gladiator. In MI2, Ethan Hunt certainly shows a lot more emotions than the average cold-hearted spy and even goes out on his own to save the woman he loves, something you don�t usually see in Bond films. Superstar Tom Cruise has never looked this good before, his new suave romantic image is given the perfect balance by villain Dougray Scott who like most of Woo�s villains are evil incarnate and are willing to give up everything to meet their goals including killing the woman he loves. John Woo was wise to come up with his much used love triangle story but this time it actually helps fuel the rivalry between the two protagonists, making the final stage of battle a much more exciting and dramatic affair. The final motorcycle joust is marvelous action spectacle which will certain remain the definitive action sequence for years to come (by Hollywood standards of course). I think John Woo was a genius to re-work the car joust in his classic Bullet In The Head to give it a more kinetic and frantic touch with motorcycles replacing the cars. However, the intensity of the Ethan Hunt and Sean Ambrose rivalry sadly are no match for intensity between the two protagonists in Bullet In The Head. But then you ask yourself, did Ethan and Sean have a long history of relationship like Ben and Paul did in Bullet In The Head? The film never really tells you why Ethan despise Sean and the two doesn�t not share enough scenes to really show you the true relationship between them. Instead the film spent too much time with Ethan Hunt and Nyah Hall developing their love, Cruise desperately trying to look like romantic heroes in Woo�s Hong Kong films. Finally I think people generally expected too much from John Woo and the talented cast of actors so they decided to dismiss the film just because it turn out to be good and not amazing. Get it in your head people, John Woo will never reach the heights of The Killer or Hard Boiled again unless Hollywood decide to let him write his own scripts and have his way like he did in Hong Kong which will never happen. I sometimes wonder how many fans of his cult HK films did he lose coming to Hollywood but of course, the number of fans that he enquired through his Hollywood films more than makes up for that. The point I�m getting at is I think John Woo fans should really stick by him despite his decision to make films like MI2. I only hope that Woo still remembers that he has his loyal fan base of his HK days (which are probably disappointed with MI2) to think of and hopefully make a Hollywood film that we can really be proud of.